Check us out on the brand new Google Places Blog. Why the move? Well, Hotpot's growing up! Since launching in November, the community has quickly expanded to millions of users who are rating more than one million times per month and enjoying a truly personalized view of the world. And so, we’ve decided to graduate Hotpot to be a permanent part of our core local product offering, Google Places. Read the full announcement here. Follow along with us on the Google Places Blog for product news, tips & tricks, and more conversations about your favorite places. Editor’s note: We recently held a contest in Portland called the Hotpot Jackpot (we also held one in San Francisco too!). The contest was aimed at rewarding the most active Hotpot users in the Portland area. Prizes included dinners for 10 at the Portland restaurant of their choice. Ian Ruder, one of our Grand Prize winners, recapped his night out with friends at Toro Bravo on his blog. We asked if we could share it here too. Needless to say, he made us here on the Hotpot team really, really hungry. Dating all the way back to Greek mythology there has always been the idea of the cornucopia – the horn of plenty that refills an endless bounty of the best food and drink as soon as it is consumed. Saturday night a group of my friends and I came as close to enjoying that bounty as anyone ever has. For four and half hours we indulged in an array of foods, sherries, wines and cocktails like none of us had ever seen. We walked away in agreement that we had just enjoyed a meal unlikely to ever be topped. Let me preface this by saying, I never win contests. Never. I honestly can’t think of one drawing or entry-based contest I’ve ever won. So when I decided I was going to win a contest Google was holding here in Portland, I understood my friends’ skepticism. The contest, called Hotpot Jackpot, was aimed at promoting Google’s new place rating application by getting entrants to rate and review local businesses and places. Normally I would have skipped over the ad, but when I saw that the grand prize was a $3,000 dinner for the winner and 10 friends, and that it was restricted to people within 50 miles of Portland, I decided it was a worthy gamble. Long story short, I rated a bunch of places, wrote a bunch of reviews, got some friends to do the same and I won. Fast forward to 7:15 p.m. last Saturday night. A few friends and I arrived slightly early for our 7:30 p.m. reservation at Toro Bravo in NE Portland only to find our long table ready and a host of smiling, friendly waitresses ready to start plying us with food and alcohol. A look back through Toro Bravo's dining room to the kitchen. For those who haven’t been, Toro Bravo is one of Portland’s true culinary treasures. They serve Spanish tapas (small plates), often with a Northwest twist. With a lengthy menu that changes on a daily basis and some of the tastiest cocktails in town, it has earned the lengthy lines that usually queue up prior to its opening. With everything served family style by one of the city’s most efficient and friendly staffs, dining at Toro Bravo is like sitting down to dinner at your friend’s house if they served the most mouthwatering and creative food. Update: One of our awesome eagle-eyed users points out that when you're searching for nearby spots — restaurants, bars, etc. — using Google Maps and Google Maps for mobile, the map automatically populates with your saved places, designated by little yellow stars. Thanks, Jeff! It's something that happens to us every day: Your friend recommends a really great place, and you tell yourself, "Must remember to check it out." But how often do you actually remember to? Recently, I was hanging out at Alice's Restaurant, a popular bar and grill in Woodside, California. It's a place where everyone goes to see and be seen on a sunny Saturday afternoon — bikers, dog owners, folks with fast cars. Sharing one of the giant picnic tables with me were Dan and Laurie, lovely folks I had just met who have lived in the area for years. As a new transplant to Cali, one of the first things I asked was, "So what places do I need to check out around here?" Thomas Fogarty Winery — the more wineries to visit, the merrier! Don’t worry Android users, you’ve got access to this feature too. Same deal: Using the Places icon for Google Maps for mobile, click the yellow star with each place listing you want to remember. 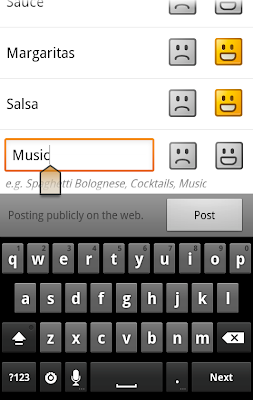 Then when you want to see your list of saved spots, go to the Places homepage > Menu > Starred Places. Whether you save your spots on mobile or desktop, it all syncs up nicely so you have the complete list whenever you need it. In fact, this past weekend, when my friends and I were trying to figure out what to do, I just pulled up the Saved list on my phone and — bingo! — winery tour, anyone? It was a blustery March day as the crowds packed the Texas Hill Country Wine and Food Festival Sunday Fair, but that didn’t keep Austinites from sharing their Best Evers with fellow festival-goers on our giant Google map of Austin! Between sips from local wineries and bites from area restaurants, the sell-out crowd pinned more than 600 of their favorite places to our map. Popular picks included Eddie V’s Edgewater Grill, Moonshine Patio Bar & Grill, and Lucy’s in Disguise with Diamonds. What are your Best Evers? Share them in the comments, or catch the giant map at other upcoming community events by following @GoogleATX on Twitter. Editor’s Note: Last week, we introduced you to Whitney, our community manager in Austin, Texas. Today, meet the newest addition to our Google family: Maria! And she wants to meet you. Join her any time from 2p to 4pm tomorrow at Portland’s Albina Press — coffee’s on her! I’m Google’s new Portland Community Manager, and I’m excited to team up with every one of you as we figure out where to go and what to do around town. We all know that Portland is the best place to be a foodie, snow sports enthusiast, intellectual, dog owner, hiker, hipster, DJ, cool parent, bicyclist — the list goes on. And that’s why Hotpot is so cool: It helps us share on Google our recommendations (and we have many!) for the very best places to go and why. We’ve got a ton of fun things planned for this spring, including restaurant tours, outdoorsy fun, urban and close-in treks, boutique crawls, tickets to shake your booty, scavenger hunts and other fun things to “Keep Portland Weird.” Stay tuned to @GooglePDX on Twitter for news and upcoming events — or just to say hello to me! — and find out more about Google’s goings-on around town via the Hotpot Blog and Facebook. You may be wondering how I’m so in the Portland know. Well, my past several years have been spent in advertising and event planning, including work with PDX Pipeline, Neighborhood Notes, Willamette Week, PrideNW.com and many other local media groups. It’s my amazing friends and working relationships in this city that motivate me to tell the whole world why Portland is the very best place to live and visit. Okay, now let’s talk about my idea of fun. Most days off, weather contingent, I beeline to Mt. Hood Meadows Ski Resort for snowboarding or to the Oregon Coast for surfing. My life in Portland began years ago, when I moved here from South Lake Tahoe to pursue my BA from Portland State University. Years later, I’m a local homeowner and married to a Portland native. Here in Portland, we are spoiled with some of the freshest organic foods, breweries and pinot noir. Hence, I take all the sushi and fish tacos I can get. My tummy’s true loves in Portland include Masu, Zilla, KOi Fusion, Pok Pok, Ate-Oh-Ate and Screendoor. Hit me up in the comments below with some of your favorite recommendations. But how can Portland be so much fun with all of this rain? The answer is that we have the most rocking live music, art and crafty scene on the west coast. Whether I’m in the mood for punk rock, hip-hop, karaoke or electro, there is always an amazing show in town. Some of the best shows I’ve seen have been at the Crystal Ballroom, Roseland Theater, Refuge, Doug Fir and Dante’s. Portland has a great art scene too, ranging from gallery art in Old Town, the Pearl District and NE Alberta, to the tattoo artists, including the crews Art Work Rebels and Adorn. We want to know in the comments: What spots do you check out during Portland art walks, and while you’re at it, who created your ink? Enough about me, I want to hear from all of you. Join me tomorrow at Albina Press — coffee’s on me. I’ll be there from 2pm to 4pm, so hope to see you there! Today, we’re happy to announce Google Maps 5.3 for Android, which lets you see your Google Location History dashboard, check in at “home,” and add your own aspects for places when rating them. 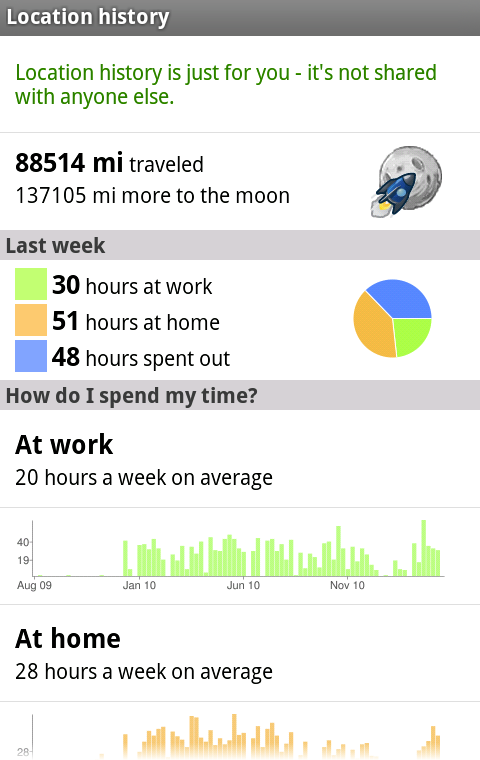 If you’ve enabled Location History for Google Latitude, you’ve been able to visualize interesting trends in your location history with a personal dashboard at google.com/latitude on your computer. 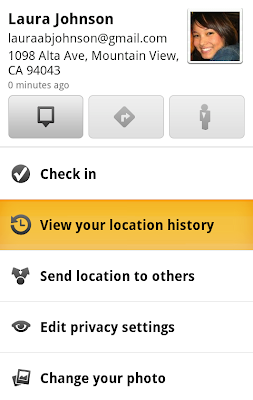 Now, you can also see your dashboard on your phone by tapping View location history from your Latitude profile. You’ll be able to see right on your phone how far you’ve travelled as well as an estimate of how much time you’ve spent at home, at work, or out. If you haven’t yet, you can enable Location History from your computer or from Latitude’s Settings menu on your phone. 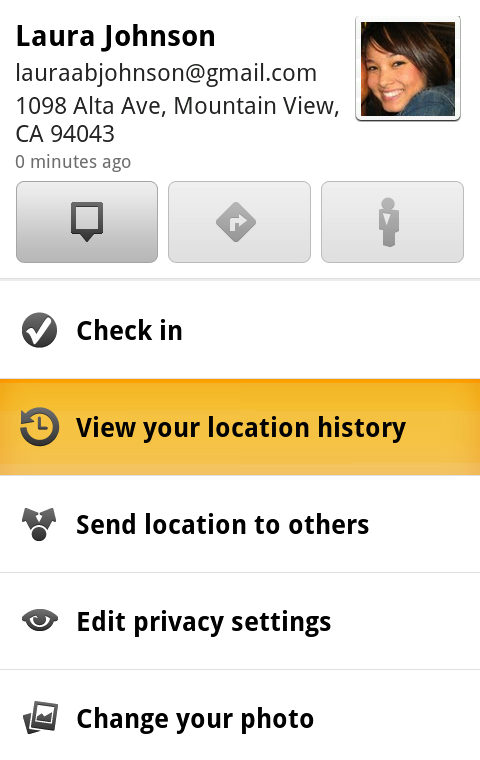 Location History is 100% opt-in and is private to you and nobody else. You can always delete any of your location history from the Manage History tab or correct the estimated work and home locations from the dashboard on your computer. View your location history dashboard from your Latitude profile on your phone and see estimates of where you’ve spent your time. Check in from Latitude and tap “Home - Tap to set your location” at the bottom of the nearby places list if you don’t have one yet. Use the estimated current address or enter in your home address yourself. Once you’ve checked in at home once, “Home” will appear at the top of the list when you’re checking in near there. Like Latitude and other check-ins, checking in at home is entirely opt-in. Your set “home” location is not searchable and only you can check in there. Just like any other check-in, you can choose with whom to share your home check-ins (along with your name and address info). When you’re rating places on the go in Maps using Google Places with Hotpot, you could always quickly leave feedback on a specific aspect or characteristic of a place, such as the food or ambiance. Before, we’d automatically include aspects about places that were commonly mentioned in reviews. Now, you can add your own aspects for each place. So if you think a place has a beautiful view or great music, you can add it yourself and quickly share it with the world. 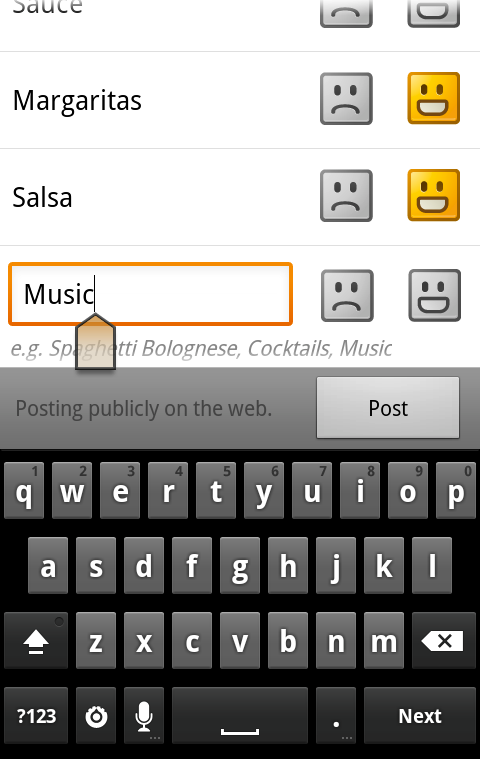 When rating places, you can add your own aspects like “music” for places and leave quick feedback. To get started, update Google Maps from Android Market on devices with Android OS 1.6+ anywhere Google Maps and Latitude are already available. Editor's Note: Not too long ago, we held a contest in San Francisco called the Hotpot Jackpot. The contest was aimed at rewarding the most active Hotpot users who attended our first L3 Location, Location, Location meetup last November at the San Francisco Ferry Building. The top three Grand Prizes included a gourmet dinner for 10 at top-notch Bay Area restaurants Chez Panisse, The French Laundry and Gary Danko. To see all the photos from our winners’ meals, check out this photo gallery. Photographs by Angelica Realce, Bertram Whitman and Araya Diaz. Below, we asked Amy Lee, one of our three Grand Prize winners, to write about everything from her experience rating and reviewing on Hotpot up and through her night out recently with family and friends at The French Laundry. I’m an aspiring foodie and one extremely lucky gal to have been invited to the Google Hotpot event at the Ferry Building. I wanted to jump for joy when I heard that the winner of Hotpot Jackpot would get to go The French Laundry. So the next day, I set off to rate and review on Hotpot and easily whipped up 75 reviews of my favorite Bay Area restaurants. Eventually, I started running out of stuff to rate, so after some Google searching for international places — voila! — memories of travel rushed in my head. I rated places I had visited in Hong Kong, Seoul, Tokyo, London, Thailand and more. The best part? It brought back so many good memories. I also emailed everyone I know, asking them to be my friend on Hotpot. As more and more of my friends began using Hotpot, my Google searches got more interesting as their recommendations started showing up. All of a sudden, Google Maps became much more personable and the ratings and reviews more meaningful. All my work paid off because I was named one of the top winners in the contest! So now let’s talk about my big dinner at The French Laundry. A sleek black limousine brought us to our destination. My family and friends were super stoked, especially my Dad. Winning this contest meant something really special, since I was able to share this experience with him. He’s a chef and has a habit of peeking into a restaurant’s kitchen to observe all the work that goes into the final presentation. In fact, he’d often invite customers to watch him cook. Upon arriving at the restaurant, he asked if we’d be able to see the kitchen, and I told him I wasn’t sure. But more on that in a second. Let’s talk about the nine-course meal that featured the freshest ingredients, from vegetables and herbs from the restaurant’s own garden, to fresh bread from Bouchon down the street. We started the dinner with a limited-production champagne made for The French Laundry. We toasted to good food, good company, and our gastromonical adventure began! The two amuse-bouche that left us lingering were salmon tartare cornets and petite cheese gruyere. The cornets, which resembled ice cream cones, were filled with creme fraiche and topped with fresh salmon tartare. The overall favorite was the Oysters and Pearls, in which freshly shucked oysters, a heaping scoop of white sturgeon caviar and chewy tapioca were presented swimming in a bath of rich creamy sabayon. Mixed together, each bite was rich with the smooth texture of the oysters, crunchy from the caviar and finally a bit of soft chewiness from the tapioca. I’ve heard plenty of rumors about this dish, and it definitely lived up to all of its hype. Throughout dinner, my dad was quiet (it’s unusual for him not to make remarks about his meal). I realized he was too focused on enjoying the food and all the complex flavors. As for me, it felt like a dream come true because two out of the nine courses featured my favorite: truffles. The White Truffle Oil Infused Custard with Black Truffle Ragout was honestly the best truffle dish I’ve ever had. Saving the best for last, our dessert course was a sweet ending. Coffee and donuts, handrolled macadamia nuts, and housemade truffles started the way. Delice Au Chocolat a la Menthe was a smooth dark chocolate cake served with mint ice cream from the garden. I’ve never had fresh mint ice cream and it was possibly the best and most refreshing way to seal our amazing meal. Toward the end, we were given little baggies of homemade shortbread and my Dad gave me a certain look. I knew what he had wanted, so I waited for our host to come around the table again. But before I even had the chance to ask, she offered, “Would all of you want a tour of the kitchen?” Our lovely host got us autographed menus from Chef Keller and then led us to the kitchen for a tour. All the hard work, preparation and meticulous effort behind a meal are often forgotten. The kitchen tour was one of many special treats for us. Watching the intensity of the thorough preparation only made our incredible meal a more meaningful experience. My dad, once again, just quietly observed. It wasn’t until the next day that he then started talking nonstop about the dinner! It was truly the meal of a lifetime, especially because I got to share it with my friends and family. A million thanks to Google and The French Laundry for making this a night to remember! Posted by Amy Lee. Photographs by Bertram Whitman.